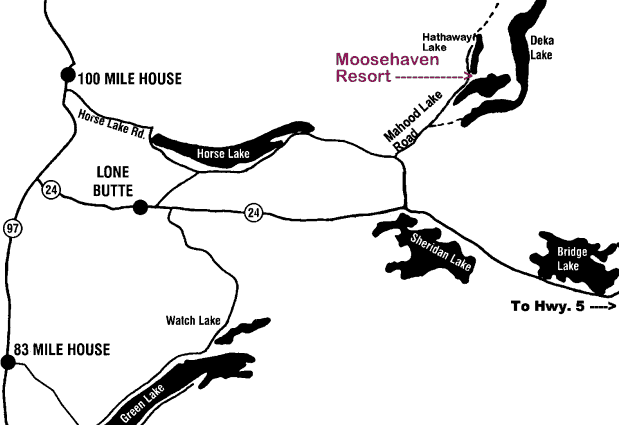 Moosehaven Resort is located on Hathaway Lake, approximately 40 km. east of 100 Mile House. FROM VANCOUVER: (via Fraser Canyon and Hwy. 97): Access Highway 24 which is located 12 km. south of 100 Mile House at 93 Mile on Hwy. 97. Travel east (turn right) on Highway 24 for 31 km. to the “Interlakes Corner” or follow the Provincial Park signs for Wells Grey Park (Mahood Lake). Turn left (north) onto Horse Lake Road. After 4.5 km, turn right onto the Mahood Lake Road, staying on the pavement and following the signs for Hathaway Lake and the resort. Travel 9.5 km. on the Mahood Lake Road; look for the Moosehaven Resort sign on the right. FROM KAMLOOPS: Travel north on Highway 5 to Little Fort. At Little Fort, turn left (west) onto Highway 24. Travel 67 km., then turn right (north) at the “Interlakes Corner” onto the Horse Lake Road or follow the Provincial Park signs for Wells Grey Park (Mahood Lake). Follow the Horse Lake Road for 4.5 km. Turn right onto the Mahood Lake Road, staying on the pavement and following the signs for Hathaway Lake. Travel 9.5 km. on the Mahood Lake Road to Moosehaven Resort. Watch for sign on the right. FROM WILLIAMS LAKE AND PRINCE GEORGE: In 100 Mile House, turn left onto the Horse Lake Road (at traffic light past the Cariboo Mall and Safeway). Follow the Horse Lake Road for approx. 30 km. Turn left on the Mahood Lake Road staying on the pavement and following the signs for Hathaway Lake and Wells Grey (Mahood Lake) Provincial Park. Follow the Mahood Lake Road for 9.5 km. to Moosehaven Resort.